Levi Dean and the Americats create a unique blend of Americana, blues, folk, rock and country that is rooted in tradition, yet contemporary. Levi Dean, the band's singer/songwriter, grew up in Virginia and was born into a family of songwriters and artists. He got his first musical instrument from his father as a child and has been playing and writing music ever since. Levi began playing professionally at age 20 when he moved to the Rocky Mountains and formed a band called Dean Station. Between 2006 and 2010 Dean Station released three albums and completed three U.S. tours. 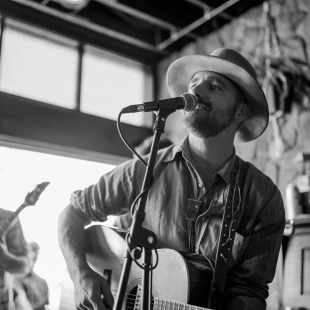 In 2011, Levi spent a year in Nashville, TN honing his songwriting skills, and in 2014, Levi relocated to San Diego where he formed his current band, Levi Dean and the Americats. In 2016 the band released their debut album, Pushing On, and completed a successful UK tour in December 2017. In San Diego, Levi Dean and the Americats perform regularly at local venues and festivals and have developed a dedicated following.